Enjoy the personalized service of Seascape’s concierge and rest assured that your Key West vacation is just beginning. It doesn’t get much better than a stay at the Seascape Tropical Inn. From our stylish, well-appointed rooms to our full complimentary breakfast, we’ve thought of everything you need for a comfortable, relaxing, and enjoyable stay. Once you experience our resort-style amenities, homely atmosphere, and exquisite charm, you won’t want to stay anywhere else for Key West vacations. 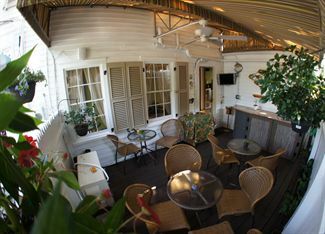 Breakfast at Seascape Tropical Inn is the perfect way to start your day in Key West. Enjoy a fresh, delicious meal made with locally sourced ingredients, including bagels from Goldman’s Deli and croissants from Frenchie’s Café. Be sure to stop by these local gems during your stay. Goldman’s has been a local favorite since 1998 and serves breakfast and lunch every day, and Frenchie’s Café is owned by a husband and wife team with the perfect recipe for French croissants. Additional items you’ll find on our breakfast menu include homemade, flavored cream cheeses and butters, waffles, French toast, English muffins, Danishes, yogurt, cereal, fresh fruit, coffee, juice, and Champagne mimosas. For a special occasion, call us for creative ideas or to arrange something special for a companion or someone you know staying at Seascape Inn.